You can execute Templates via command line processing (no user interface). Both SQL and Text/CSV templates are supported. How do I create template files? SQL Temlates: Run "SQL Scripter" and follow the steps to specify all the information necessary. In step 5 ("Settings + Go") click the "Save As Template" button to save your settings to a template file. Text/CSV Temlates: Run Text/CSV Exporter and follow the steps to specify all the information necessary. In step 3 ("Settings + Go") click the "Save As Template" button to save your settings to a template file. The template folder for SQL templates is always SQL-Scripter.exe folder\Templates and for Text/CSV templates SQL-Scripter.exe folder\CSVTemplates. /Password="Password for given User Name"
SQL-Scripter.exe /ServerName="MyServer" /DatabaseName="MyDatabase" /Type="SQL" /UserName="MyUser" /Password="secret" /Templates="MyTemplate1.xml" /OutputPath="C:\Temp"
SQL-Scripter.exe /ServerName="MyServer" /DatabaseName="MyDatabase" /Type="SQL" /Templates="MyTemplate1.xml,MyTemplate2.xml" /OutputPath="C:\Temp"
SQL-Scripter.exe /ServerName="MyServer" /DatabaseName="MyDatabase" /Type="CSV" /UserName="MyUser" /Password="secret" /Templates="MyTemplate1.xml" /OutputPath="C:\Temp"
SQL-Scripter.exe /ServerName="MyServer" /DatabaseName="MyDatabase" /Type="CSV" /Templates="MyTemplate1.xml,MyTemplate2.xml" /OutputPath="C:\Temp"
A log file will be created with each command line execution. 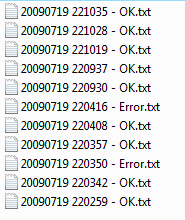 This log file contains all detailed informations, for example it the execution itself succeeded or not.